In my last blog I wrote about some notable Genevans, some of whom readers may have heard of and some of whom may be unknown to readers. After the blog had gone on-line I suddenly thought of other important Genevans that I neglected to include and decided that I would introduce you to them this month. I thought I would start with the Kenney family, Art Kenney in particular. 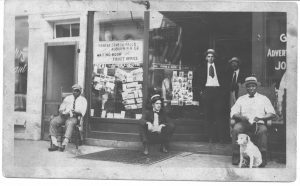 Art Kenney was well known for his shoeshine shop on South Exchange Street and was often referred to as “the mayor” of South Exchange. He performed a multitude of different jobs as well. A supporter of Hobart Athletics he was known for leading cheers during the games. To quote R. George Chase in Kathryn Grover’s book Make a Way Somehow “Art was always called upon to lead the cheers, which he did in a magnificent manner.” Art was a member of the Colored Athletic Association’s 1900 Geneva team along with minister, Rufus Derby’s grandson, Theodore Derby, and seven others. With his brother, Herman, Theodore Derby, and a fourth man Art belonged to a barbershop quartet which performed at various parties, picnics, and fraternity outings and Hobart football rallies. For brothers, John and Charles Kenney, good marks in high school and excelling at sports did not assure them good jobs or a college education. Graduating in the 1930s from Geneva High School, they found family duties, a national economy in the midst of the Great Depression, and an attitude of prejudice in the City forced them to work in positions well below their abilities. John was one of the first African Americans hired at Geneva Foundry. According to Make A Way Somehow he found that work at the Foundry paid well but could be “stunningly monotonous.” Charles felt he was not suited to foundry work and after a brief stint at Temple University headed for Rochester to work at a women’s clothing store named Wilbur Rogers where he worked as a janitor, porter and whatever else they needed him to do. However, John and Charles were both well known in the community and beyond. John coached baseball for boys aged 13 to 15 and along with his brother, Charles, Al Robinson, and Clyde Mathis organized the Geneva Men’s Club. 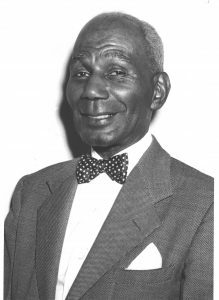 Charles was an active member of the Geneva Housing Authority, treasurer of the Sports Hall of Fame and one of the first African Americans to serve on the Geneva Board of Education. Henry McDonald, “the dean of Finger Lakes sportsmen”, was a native of Haiti who had been brought to Canandaigua by a man who imported fruit. Henry excelled in high school sports both in Rochester and Geneva. In 1941 he played half-back for the Rochester Jeffersons, a team in a league the preceded the American Football League. In 1973 he was inducted in the Black Athletes Hall of Fame. He didn’t make much money playing football, he said “In all that time I never once took home more than fifteen dollars for one day of football. And I had to play two games to get that much.” To augment his income Henry worked as a trainer for Hobart’s football and lacrosse teams from 1919 and 1929. He also worked as a janitor at the American Can Company and coached the DeSales High School football team. By the time he turned forty Henry became a professional baseball player playing for Geneva’s semi-professional team as well as several “colored” ball teams. Henry coached many men who went on to be Geneva officials and made an indelible impression on many Genevans during his life. In 1949 Rosa Blue and her husband Clifford moved to Geneva from Madison, Florida to join relatives already living here. Shortly before they arrived, the African- American community had reached a low point in their population in the city , but with the arrival of the Seneca Army Depot, Sampson Naval Base and commercial farming the African-American population began to steadily increase growing 62% between 1940 and 1950. Rosa, who died in January 2018 and her daughter, Patrisha Blue were and are Civil Rights activists. Patrisha directs the MLK Choir providing great gospel music for the Martin Luther King Day Celebration held each year in Geneva. Rosa Blue was the first female president of the Geneva NAACP and former director of the Geneva Human Rights Commission, an organization to which she devoted more than 30 years of service. It would take many more sentences to tell of all of Rosa Blue’s accomplishments and what she did and the time she gave to her community. There are many other families and people I have not mentioned, not because they were not as important as the people I highlighted but because there are so many of them it would take a long time to do justice to each of them and I might miss someone. However I can mention just a few names and you can look them up yourself if you would like. The Bland family, the Condol family, the Linzys, the Cleggets, Lucile Mallard, Lillian Collins and Clyde Mathis are just a few of the names worth checking. As I write their names I continue to think of even more people who should be on this list. I hope they will forgive me for not including their names. The people I have written about in this blog are all African-Americans. They were and are smart, hardworking, ambitious and well known in many parts of Geneva. They have faced prejudice, discrimination and racism and yet they persevered to make positive differences in life for themselves, their children, and their grandchildren. When listing influential Genevans a city as diverse as ours, the lists can be very long. In using two blogs to write about important Genevans I still have not scratched the surface as I have not delved into the Irish, Italian, German, Syrian, or Latino communities. We are very fortunate in Geneva to have so many people and groups who want to help their community, city, county, state and nation. We need to think beyond the obvious when thinking of residents who have made a difference. Afro American.Thank you in advance. I don’t know if we will be able to help you, but I will pass your request on to our archivist and curator to see if either of them know anything. Someone will be in touch if we can help you.